A fence sits around the aging grandstand, not fit for the 6670 people it was built to hold more than a century ago. BALTIMORE, Md. — It is the oldest part of Old Hilltop. Now, a fence sits around the aging grandstand, not fit for the 6,670 people it was built to hold more than a century ago. That is according the Stronach Group, which commissioned a Federal Hill engineering firm to study the structure and found significant deterioration making it no longer suitable to hold all those people. Bill Hecht, a CEO with the ownership group, was set to take questions today from the media, but that opportunity was canceled by Monday morning. Young was a little tongue in cheek about the announcement. He said he finds the timing curious after the Stronach Group was unsuccessful in getting a bill through Annapolis this year that would allow it to use state bonds to build up its Laurel facility into a super track. “It wasn’t unsafe last year; it wasn’t unsafe years prior to that, so I have some skepticism about, why now?" Young said. Councilman Yitzy Schleifer, who represents that part of Baltimore, has questions too. He wants to see the full engineering report and points to the continued disinvestment by the owners in Pimlico. Again, like the acting mayor, he too is asking, why now? “It definitely raises a lot of questions, the timing of the release of this and also how long they've had it for,“ Schleifer said. To suggest that is “off base” the ownership group said today in an email response to our questions. It said it commissioned the report at the beginning of the year, received it late last month, and just last week decided to close the oldest part of the grandstand. Safety, they said, is a priority. Still, the Stronach Group said, the matter has been studied enough now, and despite calls to release that engineering report has no plans to hand over the study. The Preakness Stakes is scheduled to be run on May 18, 2019. 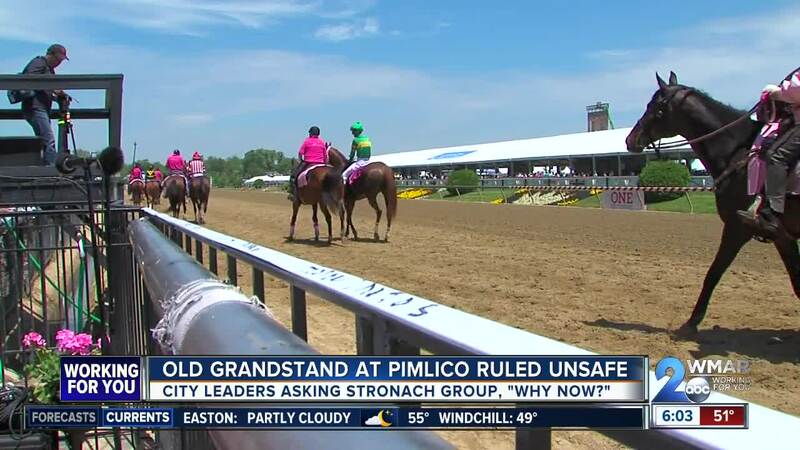 If you had tickets for the affected parts of the grandstand, the Stronach Group says you can trade them in for similar seating by May 1 by calling 1-877-206-8042.